From the day I reached the Pacific Ocean, alone on my first sailboat, I've no longer been the same. We all dream of discovering one day the place that would satisfy our deepest aspirations: I found it in the distant islands of Polynesia. Since then, I have sailed 40 years around the world and visited many countries to produce documentaries. But it was in Polynesia that I always chose to return and that I spent the most luminous of my time, crisscrossing the Socety islands, the Tuamotus, the Marquesas, the Austral and the Gambier archipelagoes. So embark with me on boadds Banana Split and we will together find wonderfu ports of call in these five magnificent archipelagoes. Gauguin, Melville, Gerbault, French polar explorerPaul-Emile Victor, Jacques Brel and many others have been seduced by their beauty, traditions, fauna and flora. 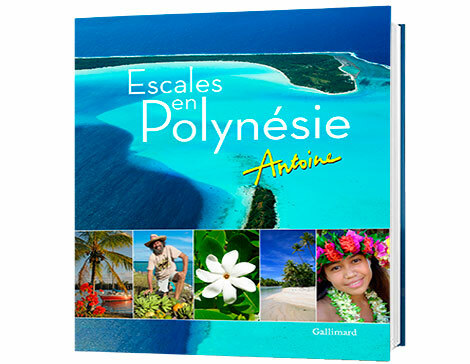 You will discover in these pages their destinies, but also the stories and works of painters, writers, musicians, great navigators or photographers who, just like me, fell i love with Polynesia!